Parabolic RMO picking can be done on a full volume or volume between two horizons, and/or constrained within a probe or a polygon area. 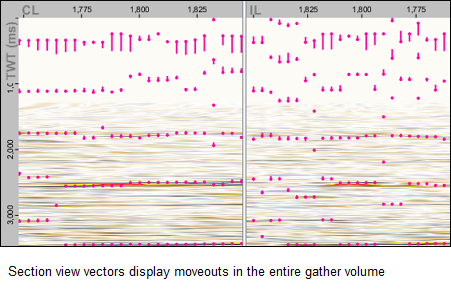 At Type, select Full volume parabolic RMO picking. This is to allow volume-based parabolic RMO picking where you can pick on a full volume, or the volume between a top and bottom horizons and/or inside a polygon/probe area. Click to select the episode in the tree to open the Details Panel. At Azimuth (degrees), type the azimuth degree to be used in the RMO picking on the 3D parabolic volume. This is mandatory. 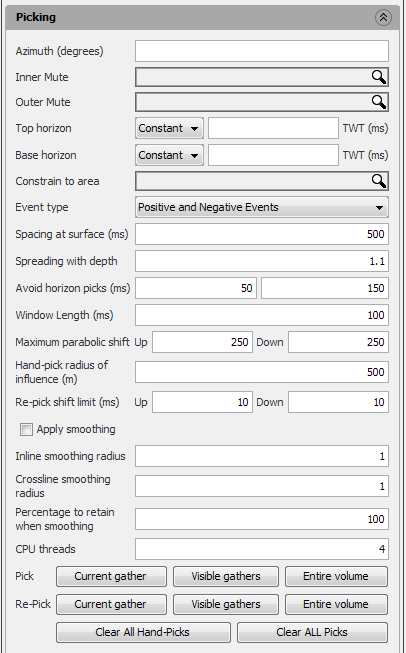 You can change other picking parameters including the Window Length (ms) and Maximum parabolic shift if necessary. 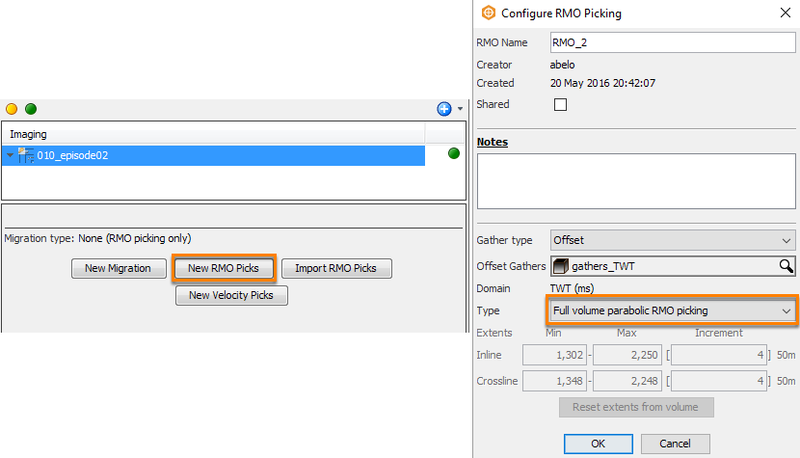 A window length of 100 ms will pick RMO in every 100 ms window. The maximum parabolic shift is calculated at the specified outer mute. The Hand-pick radius of influence (m) defines the radius the system will cover when hand-picking. At Percentage to retain when smoothing, type a percentage value to determine whether you want to apply the mean or median-mean smoothing in the process. At 100, the smoothing result is the mean of all the values in the window. 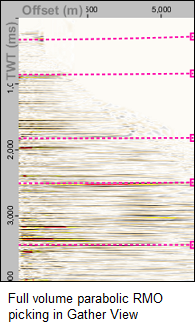 At 0, the smoothing results is the median of all the values in the window. Values in between will perform a median-mean smoothing (sort values, exclude specified % from head and tail, then average). Note: When you do a volume-based parabolic RMO picking, an "RMO Gamma" volume will be available in the Volume tab. By default, this volume will take the name of the RMO item.